This is really a non-issue. I created a Netflix account using an address from a hotel in Beverly Hills. Netflix accepted my credit card and I use a VPN to bypass the country filters. The Korean regulations are as useful now as they were 2 years ago...completely useless and ineffectual. Carry as as before. If people here are stupid enough to sign up for a 'Korean' Netflix account, it's on them. I've been enjoying full American TV here for years without any problems. Why this is still an issue is surprising. Sweet for you that you haven't had any trouble with that yet, but as they crack down harder, more people are having trouble. My GF wants to watch these shows with me but her English ain't great. 12 000W ain't a whole hell of a lot. She likes the subtitles and the ease of use of the system. There's no torrent BS, just click and watch and throw the subs on. I do have an issue with the name thing and general interference from the Korean side. Piss off and let me watch TV. That's what you get for having a girlfriend, sucka. I thought the purpose of VPN was to get around government censors and to trick others into thinking you're in another country. How would NEtflix know? Is it those free or cheap VPNs? I had a cheap one that I paid a little for and it kept crashing and getting kicked out. I bought a better VPN service with multiple upon multiple cities in multiple countries. I haven't been kicked out once. (Though I haven't tried Netflix yet.) I'm guessing if you get a really good VPN and pay a bit more, it would be less likely? Also, wouldn't these companies keep changing their IP options from time to time to evade government blockers in China and where ever? I don't know how they know, I just know that they know. I also use a paid VPN service with hundreds of servers around the world to choose from, but that didn't stop Hulu from blocking it a couple years ago when they started detecting and blocking them. I cancelled my subscription that day. 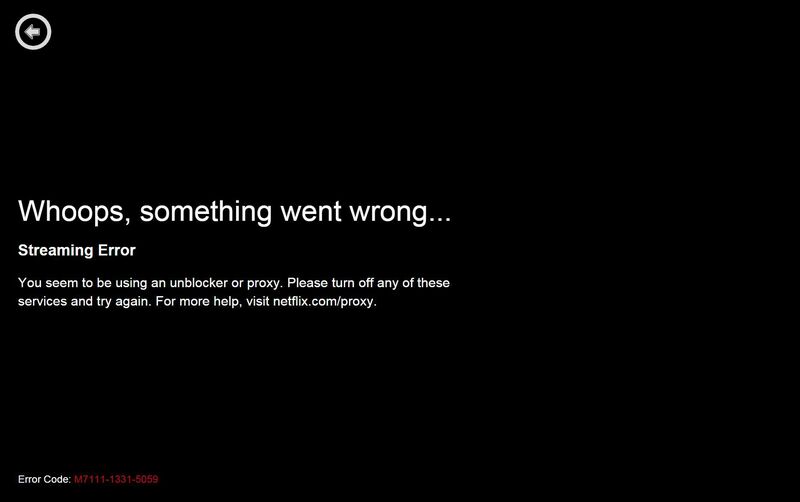 So far it doesn't look like Netflix is able to detect/block ALL VPN providers, but the number that they block seems to be increasing. You're right, though, the VPN providers themselves do have the ability to change up their server IPs and they do try to find other workarounds. They know that if they cease to be able to do their job, people will stop paying for them, so it becomes a game of cat and mouse between the VPNs and the content providers/distributors. and thus the inevitable age-verification nonsense begins. people complaining that they've been hit with this since 13 April. and of course it's not working properly. one guy was complaining on facebook that not even netflix customer support was able to get it working properly for him. Netflix could easily be buying accounts with all of the VPN services and making a list of the IP addresses, then banning anyone who has any of those. Changing your IP doesn't do anything about China; openVPN headers make it obvious that one is using a VPN and so they look for those tell-tail signs. But if you the VPN connection were encapsulated inside an SSL connection, then to the ISP (or China) it'll look no different than a regular encrypted https connection. But if you were to have everything encrypted, it's suspicious because real normal users at least occasionally use regular http connections. Yup, I feel him. I phoned customer support a few times trying to resolve this. Basically, the problem is that the system doesn't work for non-Korean citizens. (Yes, I've done countless phone verifications, age verifications, using similar systems in the past in Korea, but this one doesn't work). There's nothing they can do (at the moment) to fix it. BUT, and here's the beauty of it. The verification doesn't need to be in your name. You can use ANY Korean citizen's details to verify, and it would work just fine. I used my wife's phone number and details and it worked just fine. Any under-age kid would just need to borrow their mom's phone for about 45 seconds in order to bypass this whole verification system. I actually managed to get this working easily enough. You have to enter your name exactly as it appears on your phone bill. For me it was all in caps with my last name first and then my first and middle name so like SURNAME FIRST NAME MIDDLE NAME. But of course it depends how your name appears on your phone bill. The annoying thing is it took a couple of days because you can only try like once or twice in a 24 hour period and initially I was just entering my name like normal. Another annoying thing with Netflix in Korea, they don't warn you when a show or movie will be taken down. Was watching an idiot abroad with my girlfriend. Just starting season 2, logged on last night and it's gone. On Netflix back home they'll have a message warning if the show will be taken down soon and give the date. Are you me? We went home last night to watch the Brazil episode and it's not there! Also, Peep Show used to be 8 seasons and now it's just 1,5 and 8. We watched it all though so we're safe. How are you guys watching your Netflix? I had US Netflix down for a couple weeks, then it got fixed and it working fine. And I go back and forth between the US and Korean Netflix all the time... and I've never been prompted for the age-verification thing. Netflix bros. I was watching An Idiot Abroad, Brooklyn 99, and Orphan Black (which looked like it just got put there) last week, i tried to watch them over the rainy weekend and they were all effing gone. Actually, the only reason I took a break from watching the shows was the age verification. It wouldn't let me watch Better Call Saul. I typed in my info various times, and it wouldn't accept it. I got pissed and didn't touch Netflix again because i was thinking i should just cancel it. I'll try your guys suggestions. I didn't think about doing all Caps--I didn't think that would matter. I don't get how much business sense it makes to make things harder for your single/childless customers. How about people be responsible for their own kids and not use tv, the internet, and netflix as a babysitter? Also, everyone pays by credit card. I don't know anyone under 18 with a line of credit. What baffles me is watching Sons of Anarchy on American Netflix but being asked for age verification to watch Seaquest because its restricted content? I dont get it. Where has better call saul season 2 gone? Nah, **** THIS MAN! You try and play by the rules and you get shafted. I'm just gonna torrent stuff from now until the end of time. "The date of birth you entered doesn't match the account on file. Be sure to enter all 4 digits for the year." What's going on here? Might have signed up with fake dob to keep the feds off my back and I can't view it or change it! It's a Netflix Original! How does that work? With other shows I get that there's licensing (although it does frustrate me sometimes), but this is their own content!